Lee Sung Kyung & Lee Sang Yoon Reading Script for TvN New Drama - Lee Sung Kyung and Lee Sang Yoon will be the cast of new TvN drama ‘About Time’. The drama will be on Monday-Tuesday slot. 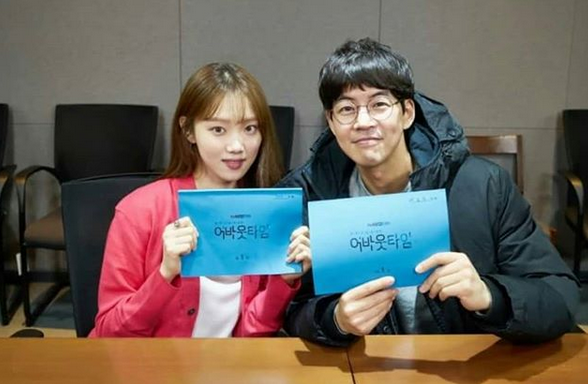 TvN, recently released a photo of script reading of Lee Sung Kyung, and Sang Yoon. ‘About Time’ started the producing by the first script reading in Seoul last February. The main actor is Lee Sang Yoon, Lee Sung Kyung, Im Se Mi, and Lee Seo Won, also veteran actor Kim Hae Sook, Na Young Hee and Jung Dong Hwan are the cast of the drama. The first script reading is held for about 4 hours. ‘About Time’ is romance fiction which telling about Cho Michaela (Lee Sung Kyung) who has power to see other and her self life expectancy. While Lee Do Ha (Lee Sang Yoon) becomes a man who can stop lifetime. This is Lee Sung Kyung comeback after `Fair Lifting Kim Bok Joo` drama. Lee Sung Kyung also on the reality show Small Town Cinema recently. Are you curious about her new drama? let`s wait and cheer her up.